I have finally begun contruction on a more permanent residence for my flock. Right now I have 3 small coops sort of pieced together. So, this will be a grand consolidation when it is complete. There are several features that I am looking forward to having, but most importantly, more room. My other coops were small elevated coops, so they were difficult to clean, collect eggs, etc. This coop will have external egg doors. Being able to walk into it will make cleaning much easier. Will also have plenty of storage so I can keep the feed in the coop. 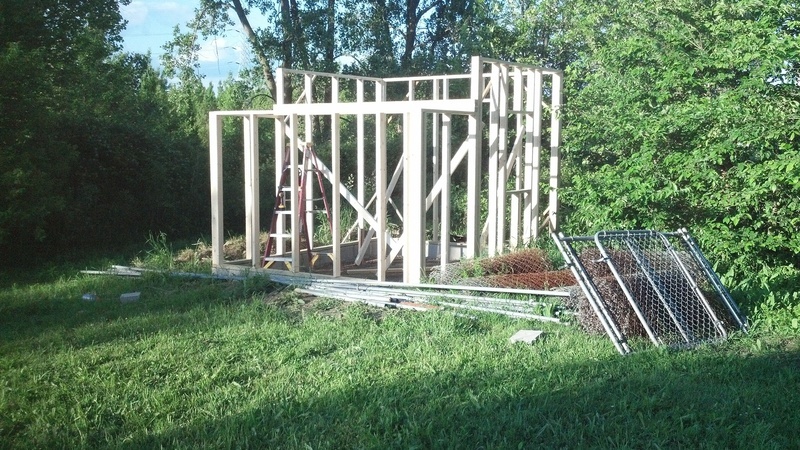 The 8' walls in the main part of the coop will be nice. The roosting/nesting area has a 6' wall. I was going for a little architectual diversity rather than just having a plain box of a coop. It will have opposing roofs, the main will be a standard gable, and the roosting/nesting area will have an opposing shed style roof. Yes, I am aware that it looks more like a house than a chicken coop. My wife was kind enough to point that out already. She asked if it was going to be two floors. My 5 year old asked later, "daddy, are you building a new house?". Straight from the mouths of babes. I got down from my ladder and took a few step back....it's not THAT big is it? Yep...it is. At least I am able to recycle my own cyclone fence I had laying around.